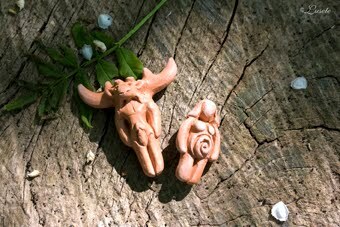 Watched over by the Lord and Lady (courtesy of the lovely figurines made by Damh's partner, Cerri Lee) we began the shoot on a beautiful sunny day in glorious woodland. On the agenda for day one, filming Damh performing 'Pagan Ways', the first song in the movie and also the 'flashback' section of the song 'Green and Grey', in which a Twelfth Century monk confronts the Horned God in the woods and accuses him of being the devil. So in one way a nice easy start as everything was to playback, so we didn't need to worry about sound. The complication was that this shoot contained Gary's cameo as the monk, so there was a fair amount to film where he would be in front of camera. 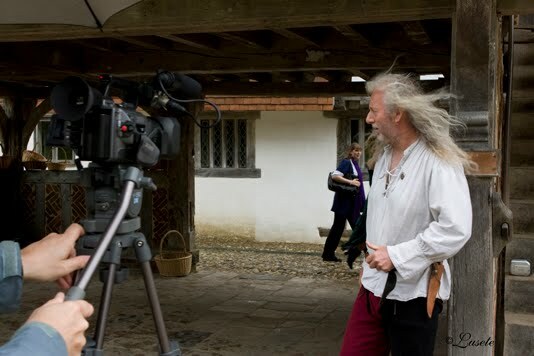 Still, that was scheduled for after lunch, meanwhile we had a Bard to film! So after a quick briefing to the crew - and watched over all the way by Marq English (above, left) who is filming our 'behind the scenes' video - we rolled camera. We filmed Damh perform the song six times, each time using a different camera configuration, giving us plenty to play with at the edit. Once we had this in the can, it was time to break for lunch. 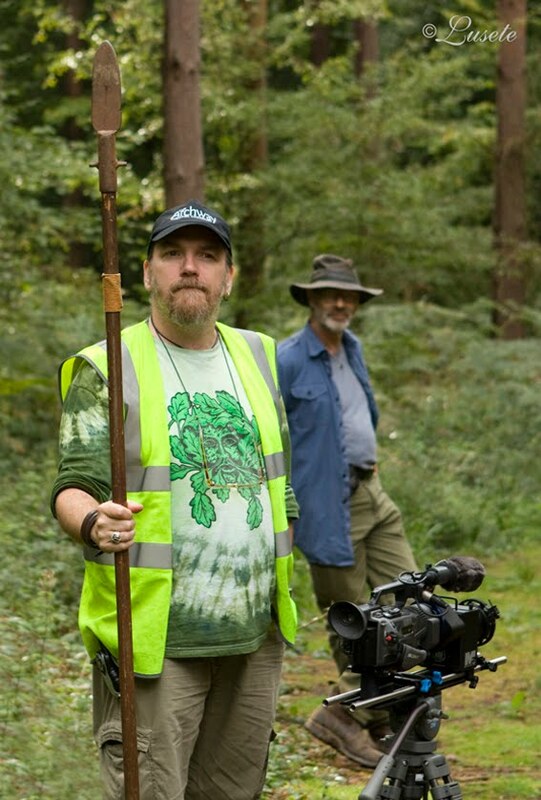 After lunch, it was time for Gary to 'monk-up' and we started shooting the 'Green and Grey' footage. We were very lucky to have on set with us a guest cameraman in the form of the lovely Chris Bouchard, the man responsible for the excellent "Hunt For Gollum" (http://www.thehuntforgollum.com/about.htm) which made life unbelievably easier for everyone as Gary could relax and get on with the job in hand - namely playing the monk and trying not to fall over too often! This section of the script has been very tightly storyboarded, so by 5pm we had shot everything we needed. The weather had stayed perfect, the equipment had behaved and everyone was able to go home happy. This was quite possibly the best start we could have had to this project and we can't wait to get out on the next shoot, scheduled for the end of May. 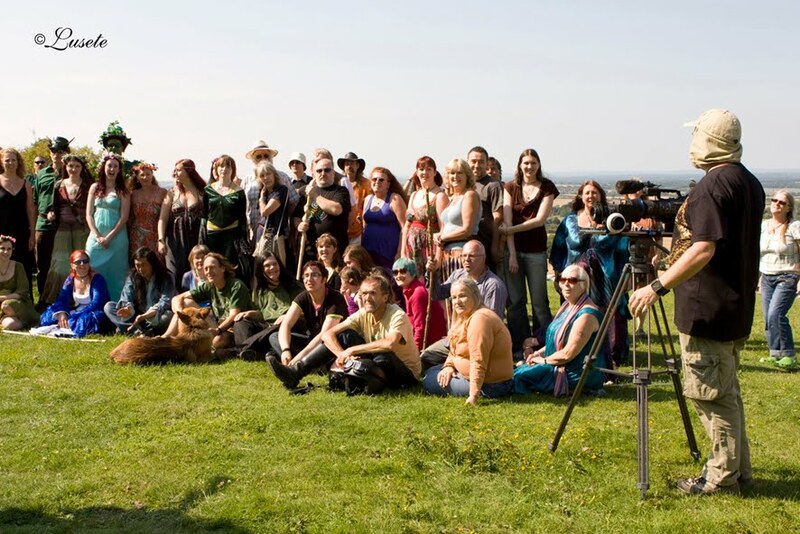 The cast and crew assembled at our house for a costume and make-up call, then, once everyone was ready we headed off in convoy to Stone Farm Rocks. These sandstone rocks in the middle of some beautiful woodland made an excellent setting for the scene we needed to shoot today - the final scene of the film, known as 'The Epilogue of the Gods'. Ironically (and typically for movie making) this scene is the first time on the shoot we have had all the Gods and Goddesses together in full costume - and stunning they all looked too! After a week of unsettled weather, the Gods were once again kind to us and the conditions were perfect for the shoot - not too sunny, so we didn't have squinting Gods and heavy shadows. Instead, we had a thin cover of cloud - nature's very own diffuser! Whilst there, we also shot some individual shots of each God for the teaser trailer, which we are putting together right now. The main shot of the day was a very complex hand held tracking shot in which all 5 of them share a poem. Consequently, the pressure is on for everyone to remember those lines and for me not to trip over! Happily, we managed to get it 'in the can' in surprisingly few takes and were able to wrap bang on time. 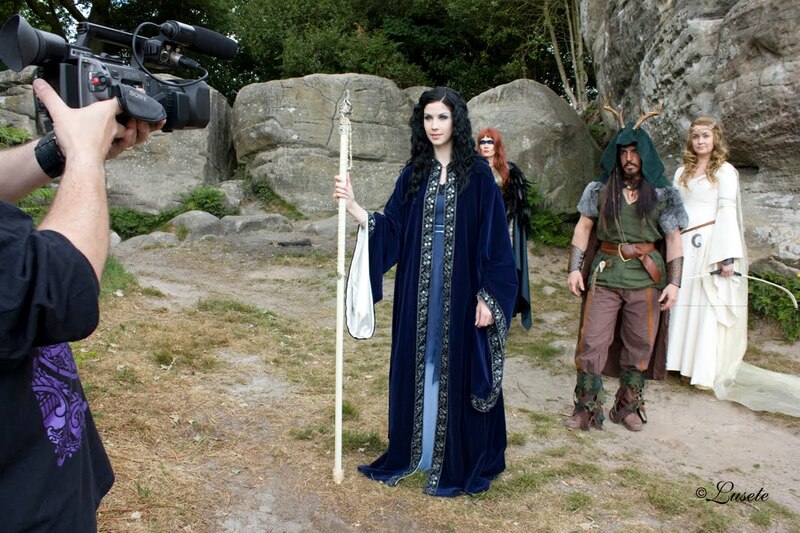 Gary shoots Arianrhod (Lucy Brennan), Morrighan (Joanne Marriott), The Horned God (Seán George) and Ceridwen (Joy Tinniswood) for the closing shot of the movie. A very interesting day, this one, as in the morning we had a very small shot in the director's kitchen - a simple dialogue scene between the character of George and his soldier brother. This went very smoothly and marked the first time on the shoot that one of our human protagonists has been in front of camera. Then we spent the evening in a basement in Brighton on a Green Screen set, shooting footage for the songs "Pipes of Pan" and "Lady of the Silver Wheel". This provided several challenges for both cast and crew and was a new experience for most of us. 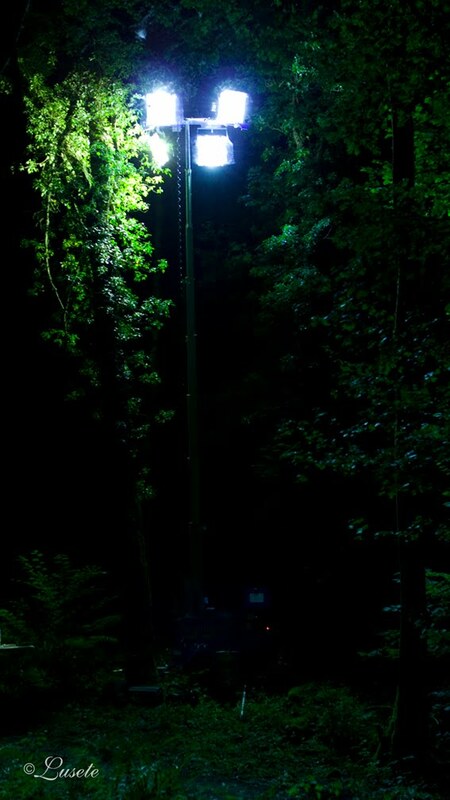 Most critical is getting an even light on the green so it can be removed more cleanly in post and after a bit of fiddling I think we got there! The shoot went surprisingly smoothly, helped by the fact it was very tightly boarded and the crew were amazing and really 'on the ball'. The only dampener on the day (apart from the drive there in the pouring rain, making us VERY glad we were shooting indoors today) were the parking tickets we got outside the studio. Oh well, you can't win them all! It was a cold, damp morning at a ridiculously early hour when 8 intrepid cast and crew gathered at 'Albion Central' to head off in a dark blue mini-bus for a 2 day road trip. The plan was to film the bulk of the opening prologue to the movie at various iconic locations, whilst trying to keep dry! Our first stop (at around 8am) was the Rollright Stones, a wonderful, magical stone circle (and the furthest north we would be tracelling). We parked up at the side of the road and Lucy got into her Arianrhod costume in the less than glamourous surroundings of our mini-bus (already christened 'Starship Albion' by this time!). The sun gloriously broke through the clouds and we got all the shots we needed and were able to move on about half an hour ahead of schedule. A good start but we doubted our luck would hold and had several umbrellas on standby! Providing a goddess with her glow! Next stop was the fabulously impressive Uffington Hill Fort and White Horse. We needed a craning shot here with the hill in the background. When we arrived it was covered in school children on a field trip but by the time the crane was set up they had vanished and we were able to get the shot with not a soul in sight. A few light spits and spots of drizzle but no need for umbrellas just yet! Guiding the crane to a smooth stop. Just a short hop from there to the next location - Wayland's Smithy. easy shot this and again - perfect weather and the school party turned up as we were packing the kit away again. Starting to think that maybe, just maybe the Gods might be watching over us... Delicious lunch at the White Horse Inn (thoroughly recommended) then on to grab a quick shot of Glastonbury Tor. We find ourselves about an hour ahead of schedule at this point and push on. We arrive at our accommodation for the night, the delightful Woodleigh Coach House in Cheriton Bishop on the edge of Dartmoor and drop off our bags (http://www.woodleighcoach.com). There are severe weather warnings for the next day and as we are so ahead of ourselves, decide to go out and film the shots we have planned for sunrise the following day at sunset instead. So we pile back into the bus and head off for Hound Tor, an amazing granite rock formation, one of many that are scattered all over Dartmoor. Although there are several groups of climbers using the Tor we manage to get all the shots we need with no extraneous bodies lurking in the background and with stunning light as the sun begins to set and the rain clouds roll in. One of the last shots of the day. So, we grab some fish and chips on the way back to the hotel and crash into bed to recharge our batteries (metaphorically and in my case, literally!) for the next day. When the Friday dawns we are amazed to see blue skies and fluffy white clouds so without hanging around we head out to our first location - Canonteign Falls. This is the highest waterfall in England and is in private parkland that is open to the public (at a price!). We have permission to shoot there for an hour before it opens, which we do and get some magical shots. Stop 2 is the eerie and atmospheric Grimspound (also the subject of a song by Damh the Bard that is not part of the soundtrack to the movie) - a bit of a hike from the road but well worth it. Lucy about to become one with the land! We bid farewell to Dartmoor with lunch at The Warren House Inn, a very cosy place full of history smack in the middle of the moors before heading back home, stopping on the way at Cerne Abbas to grab a shot of the giant and of course, Stonehenge. Despite driving through torrential rain, at every stop the clouds cleared and the sun came out. It would appear that we were well and truly blessed on this journey and hopefully the footage we managed to get will be a wonderful opening for our film. 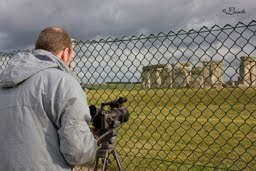 Surely the fence will get in the way? A very different filming day today as we tackled a 3 page dialogue scene set in a hospital A&E waiting room. 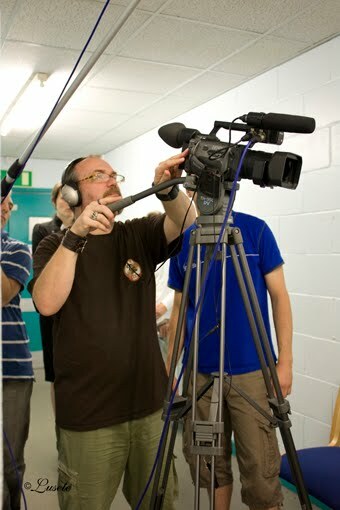 For a while, it looked as if we were going to be able to film in a real hospital but when that came to nothing we were fortunate enough to be allowed to film backstage at The Hawth Theatre, Crawley. The corridor where the dressing rooms are situated makes - with simply the addition of a few signs - a very convincing hospital. This scene was really the first extended dialogue scene we have shot so far and went very smoothly. We had a mixture of old friends and new on set - alongside our 2 principals (Joanne and James as Morrighan and George) we had Hannah and Jo playing George's friends. 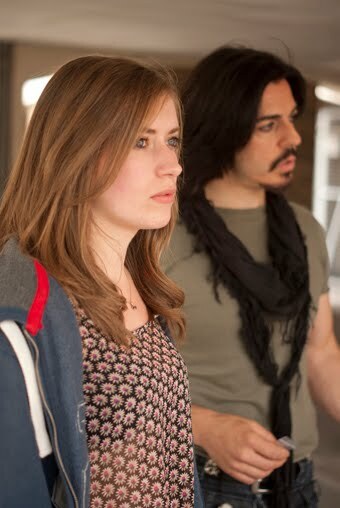 Hannah is new to the project but Jo created the role of Ceridwen in the original Youth Stage production. Too young to play the role in the film it was great to have her back with us, even if just for the one day. 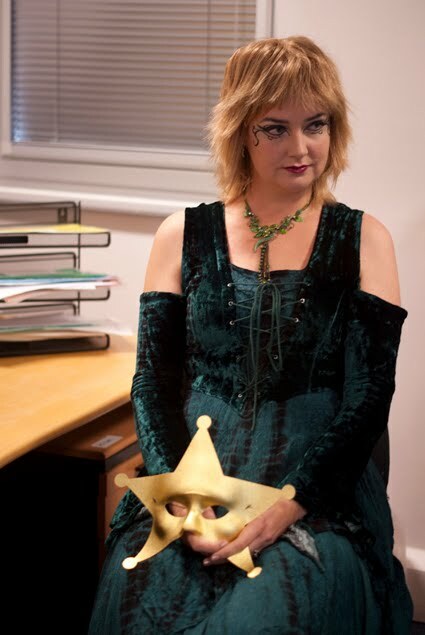 Also, repeating one of her roles from Witchfest we had Elaine as our intimidating Irish nurse and in a cameo appearance as the doctor, Corin - who played The Horned God at Witchfest. Lining up a shot... ...applying a dash of blood. Gary fixes James' head wound. SPOILER ALERT: Skip this next chunk in italics if you don't know the story already and want to keep all the mystery intact! ...right, are you back with us? Good. Anyway, long search as we really needed to shoot in a churchyard, blah, blah. It was really nice, as this was the first scene we have needed to have background artists involved and after a call on Facebook we managed to collect a decent sized 'congregation'. The opening shots consisted of a conversation between Annie, her brother (the Priest) and Esther for which we set up a long tracking shot. This went very smoothly but we then were forced to pause for 20 mins or so whilst a real congregation arrived for a baptism (something the person on the phone had failed to mention when they said we could film that morning!). 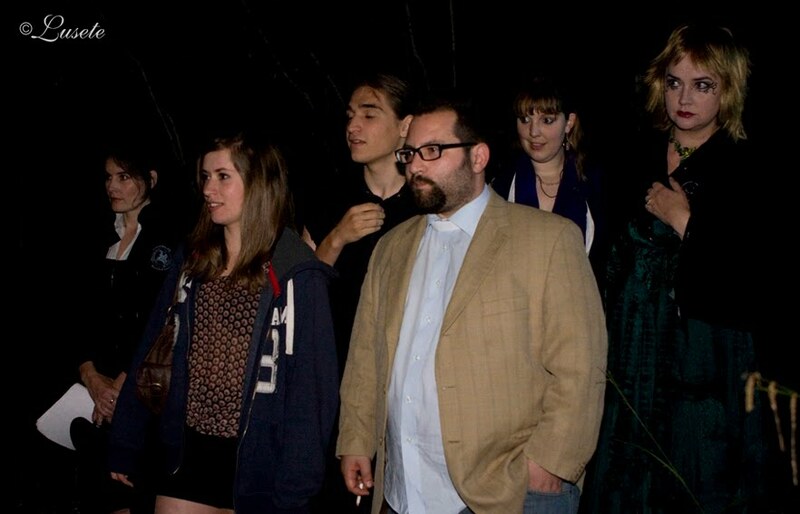 Once they were all in the church we were able to carry on and get the rest of the scene in the can. 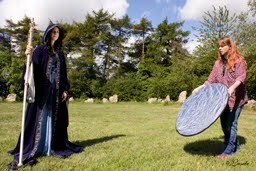 The background artists and our Priest were then free to go as we went round behind the church in to graveyard to carry on the next part of the scene, where some of our Gods appear to Annie and Esther. An extra compication was that Seán (our Horned God) had a job on that day and was unable to attend, so we storyboarded carefully to allow us to shoot his angle another time. Hopefully, the join will be invisible when you see the finished film! Once again, we finished on schedule and stayed dry! The following morning we returned to the location with a skeleton crew and filmed Seán's pick-ups, so that is another scene in the can! "Yes, I can hear them..."
A cold, wet morning - and we are up at stupid o'clock to head over to the Weald and Downland Open Air Museum near Chichester to shoot the flashback scenes in the song 'Samhain Eve'. We have the location for 3 hours, from 7am to 10am, and then it is open to the public and we have to be gone! 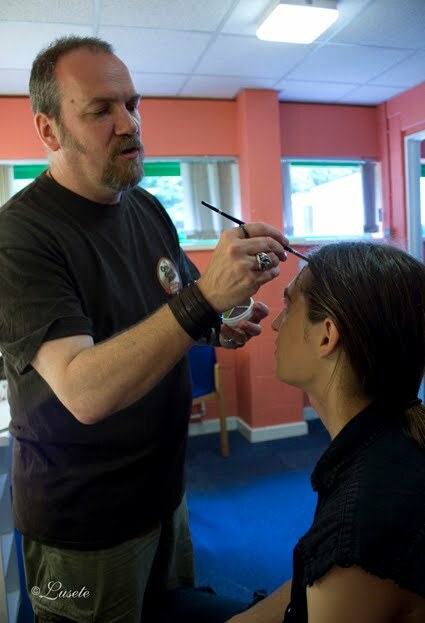 We meet in the car park at about 6:40 and are taken round to our 'staging area' - a lecture room near our main location where the actors can get costumed and made up. While they do this, we prepare the set - a beautiful, original fourteenth century farmhouse that is dressed in period inside. We check light levels and set a fire going in the main hall. At the same time, our 'village extras' are busy dressing the Market Street location ( a 5 min walk from the Farmhouse). The rain is pelting down so we elect to shoot the interior's first in the hope that the weather will improve by the time we need to shoot the exteriors. If it doesn't, at least we won't be any worse off! With the exception of 2 lines, all today's shots are to playback of the song so sound is not a major issue. 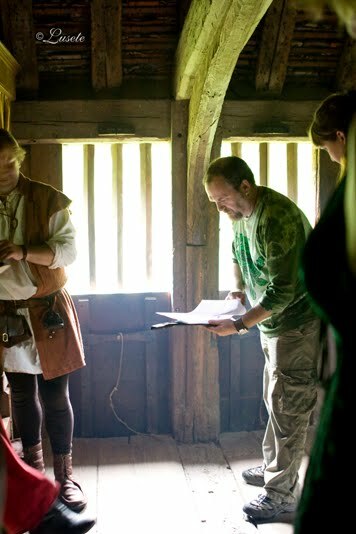 We have several extras on set as the medieval family, including a 14 month old boy who seems to cry on cue every time we need him to act scared (we have a theory it was Emma's singing on the playback that did it but she is having none of it!). The light inside the building is amazing and it turns out that we only need extra light for one effect, so we mainly go with available light and a wide angle lens for all the shots inside. 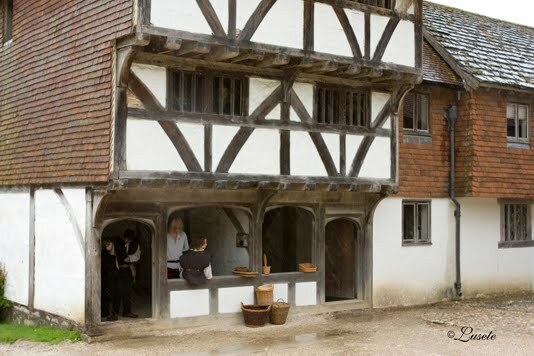 Once all the interiors are done we head on down to the village location and shoot some tracking shots past the wonderful buildings there (the more observant of you will recognise this location from 'The 10th Kingdom' and many other films and TV shows!). The rain has eased off but not stopped altogether so there is much umbrella weilding to keep both equipment and performers dry. Finally, after getting the shots we need there it is back to the Framhouse and a couple of craning shots to finish, then everyone packs up and we are out. In light of the adverse conditions, the Museum folk let us over-run by 15 mins, which is all we need to get everything we want - then we all head down to the on-site cafe for hot tea and bacon rolls (or cake!). An amazing morning and hopefully some stunning footage. Extras sheltering from the rain in the Market Street Our amazing location - even stunning in the rain. 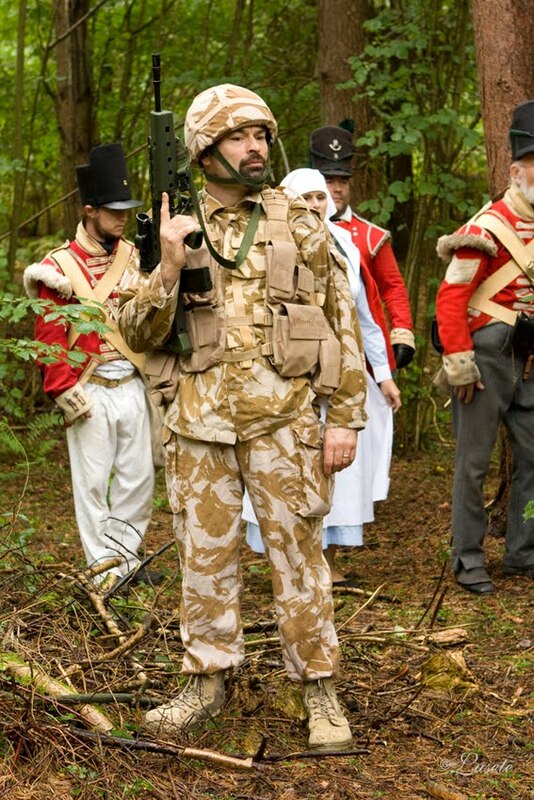 What would the low budget film-maker do without the generosity of re-enactors? A couple of craning shots to finish the shoot. 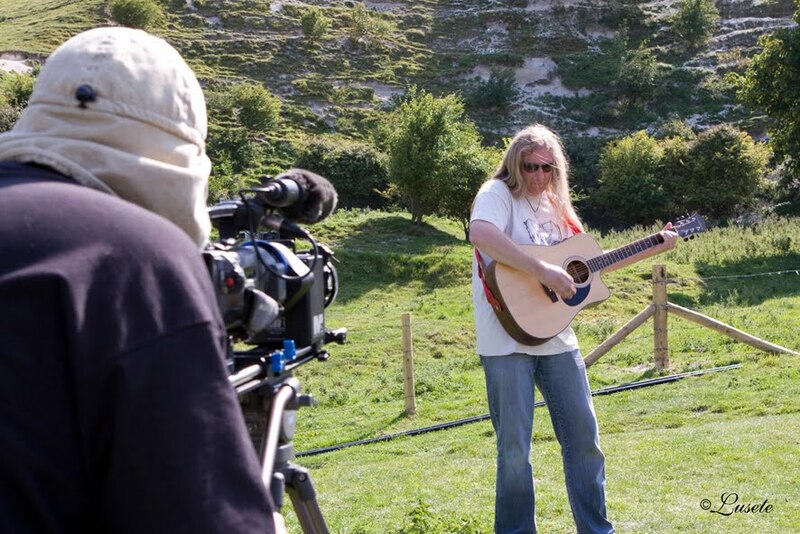 On a day that couldn't have been more different to the last shoot we found ourselves on the South Coast at the very beautiful Cuckmere Haven where we were to film a section of the song 'Land, Sky and Sea'. I was last there about 10 years ago filming the opening scenes to my movie of 'Twelfth Night' where the shipwrecked Viola is washed up on the beach. That same spot was cut off by high tide this time so we filmed by the side of one of the inlets, with the grass and cliffs in the background. Despite the hundreds of daytrippers, brightly coloured canoeists and the incoming tide lapping at their ankles, we wrapped filming Séan and Ella in time for lunch. Séan (The Horned God in human guise) and Ella (as Annie) sing 'Land, Sky and Sea'. 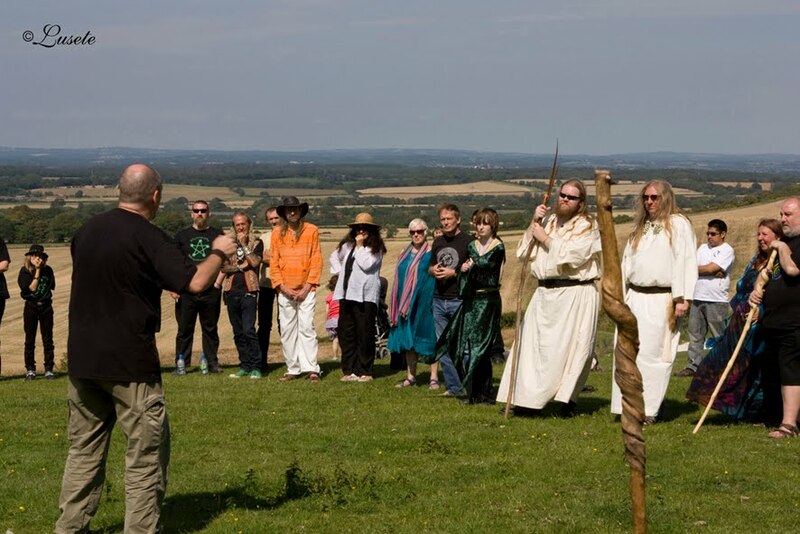 After a lovely lunch in the Giant's Rest pub we grabbed the kit and hiked up the hill to the fabulous Long Man of Wilmington, where Damh was conducting the Lughnasadh ritual with the Anderida Gorsedd. 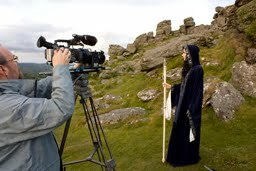 Once the ritual was over it was time for the 2nd batch of filming for the day - Damh performing 'The Spirit of Albion' to the crowd (which numbered 64 - an amazing turnout). 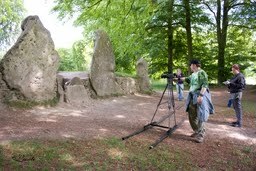 Gary films Damh in full flow at the feet of the Long Man on the 'A' camera - first take. Getting ready to shoot the crowd on the 'A' camera for the 2nd run. The atmosphere was amazing - the crowd clearly love Damh's music and were still as enthusiastic on the 5th take as they were on the 1st! 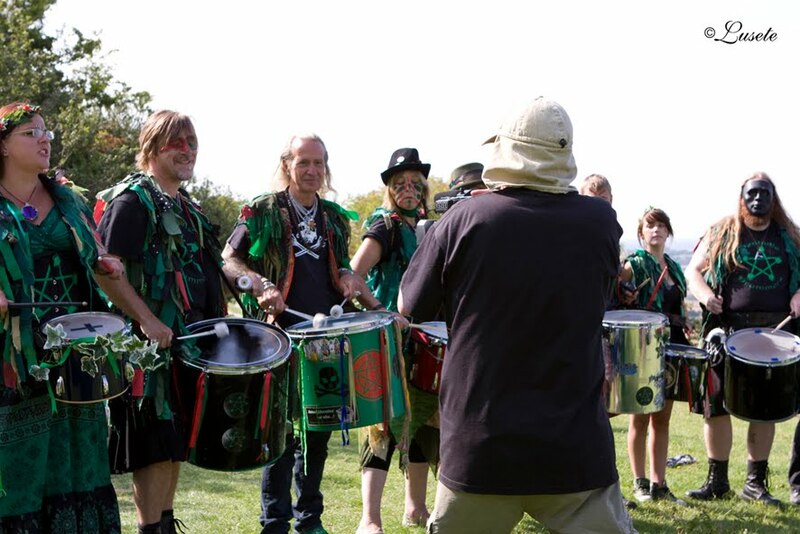 One major contributing factor to the party atmosphere on the hill was the presence of the Pentacle Drummers. Going hand held, around take 4! Joy as Ceridwen and Emma as Esther singing 'The Cauldron Born' with Damh back in his robes as "...a man alone on a hill, his arms raised high to the moon." The moon? On a blazing hot July afternoon? Well yes, this sequence we are filming 'day for night' - meaning we will colour time the final footage to make the sunlight look like moonlight. We finally wrapped the day at around 6pm and drove home weary, a bit sunburnt but ecstatic! It was a very special day - the magic of the place and the goodwill of the crowd will stay with us for a very long time. Today was all about the scenes where Annie first meets her mysterious guide in a café where she has gone after leaving her lover in bed. Due to the scheduling we had to film the 2nd half of the scene first – a street outside the café where she has a confrontation with her brother, the priest (Olly Reeves making a welcome return appearance). A private car park was doubling as this so we had more control over our environment. On the location scout this seemed like the perfect spot and aesthetically it was… what I wasn’t banking on, however was the Ramadan concert going on in the town centre just down the road! Luck was on our side though, as we managed to get all our dialogue shots done in the gaps between the really loud noise and we were onto filming some of our song (to playback) when the really noisy bit kicked off! Seán and Simon keep tight hold of the camera! Once wrapped on this we headed off in convoy to location 2 – the very lovely Dijo café in Horley. When inside this Portuguese run café you could really believe you were somewhere in the centre of London (which is the implication) and they had very kindly given us permission to film there once they closed at 3pm. So in we all piled and filmed the first half of the scene – although typically with the perverse world of filming, the very final shot we filmed was actually the opening shot of the scene, as our waitress Carys (who created the role of Esther in the original Youth production) was at a Dress Rehearsal for a play and was arriving late. Another successful day. 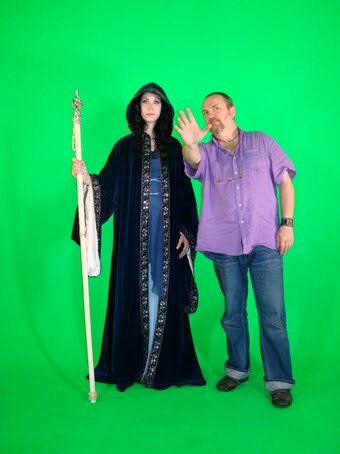 One extra pleasure was the presence of Gary and Ruth from the Celtic Myth Podcast who are joining us for the principal shoots. Despite the serious nature of this scene, we did manage a few smiles! Setting up a shot for Carys (our original stage Esther) for her cameo. Another very different day as myself, Stevie our stills photographer, Seán and Ella jumped on a train and headed up to London to film, guerrilla style, a few shots for the song ‘Land, Sky and Sea’. We were chatting so much on the train we missed our change, so instead of getting in to Waterloo we ended up at London Bridge which meant a long (but very pleasant) walk along the South Bank to our location, just west of Westminster Bridge. Technically this was an interesting shoot as usually we have a huge ‘boom-box’ we play back the tracks on for the cast to mime to but as we were trying to be as unobtrusive as possible, this was out of the question. 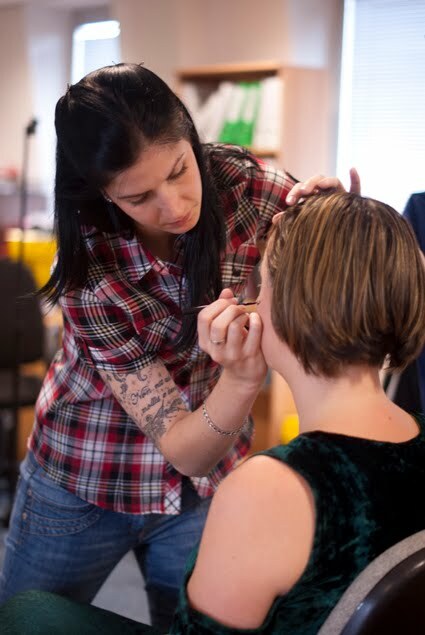 Instead, for this first set of shots overlooking the Houses of Parliament the actors wore concealed earpieces and we played back off the iphone! I wasn’t entirely happy with the first set up though and as we walked across Westminster Brige heading for our 2nd location I saw the opportunity for the perfect shot – so we filmed this section again. "Cynical thoughts, and lies that distort..."
Then we relocated to Picadilly Circus, our next location. This time, because I needed the camera to circle the actors we actually put the iphone in Ella’s hood so they could both hear it without me seeing it! "So, you look natural and have a little sing-song and I'll be over there trying not to be noticed..." "Hey, your hood is playing our song!" 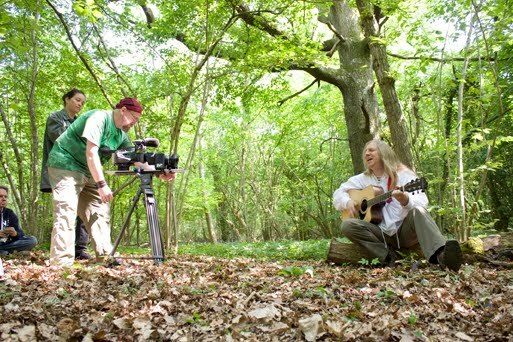 A nice easy shoot, close to home – well actually AT home, as I filmed the insert shots of the gypsy and ‘young Damh’ for the song ‘Cauldron Born’ and some montage shots for the opening prologue in my house! Bit of a different one today. Went to Losely Park where the Sealed Knot English Civil War Re-enactors were recreating a battle with more than 2000 people and grabbed some very handy shots for a certain song about the Goddess of the Dead of War! 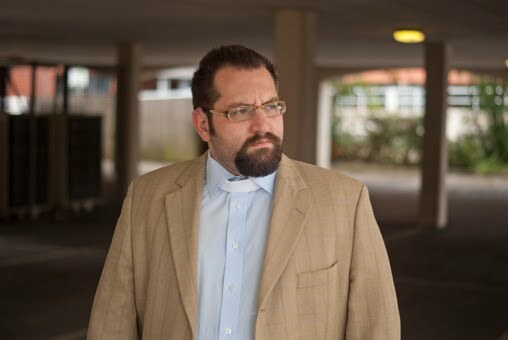 Thanks to the generosity of a friend at stevensdrake solicitors, Crawley ( http://www.stevensdrake.com/ ) we had a very pleasant, comfortable and absolutely thrilling afternoon’s filming. The scenes we were shooting were all those set in Esther’s office, including the pivotal scene where she meets Ceridwen for the first time. Filming in a real, working office gave the scene an authenticity that is impossible to fake (on our budget, anyway!). What we could fake was the time of day as we were supposed to be filming a night scene when in reality it was a lovely sunny afternoon. Strategicly placed bin liners behind the blinds soon sorted this however. We were joined today by two new actresses, Lindsay Clarke playing Esther’s manager and Sarah Anne Hovelle, playing her client. Those of you who saw the stage show at Witchfest will recognise the latter as the actress who played Annie in that performance. Both performed their roles flawlessly and will be a great addition to our movie ‘family’. Another bit of production value today as we went along to Herstmonceaux Medieval Festival and grabbed some stock footage of the massive Wars of the Roses battle re-eanactment. Bows and arrows, knights in armour and very loud cannons! The plan was to shoot all of the scenes set in the glade, where the 3 humans meet and tell their stories and the gods are revealed. There was a huge page count to get through, so everyone had to be on top of their game if we were to stand any chance of finishing. So at 22:20, the cameras started rolling. 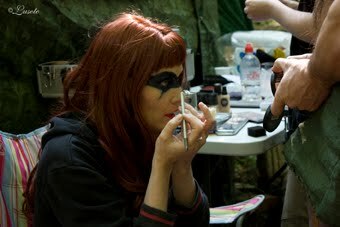 Apart from a slight deviation to allow for a costume and make up change we pretty much shot in sequence. This was to prove invaluable as the shoot progressed as the light began to change with the approaching dawn. As the scene in the film heads into dawn this was what we had planned for and it worked a treat – the gradual change in light will be very effective. What was less useful however was the rise in air traffic as the morning approached which meant having to stop every 5 minutes for a plane to go over. When we looked at just how much we had left to shoot we made the decision to ignore the planes and keep shooting, relying on dialogue replacement in post instead, So all our cast will be heading into the sound booth at some point to re-create at least a part of their performance – another exciting experience to come. 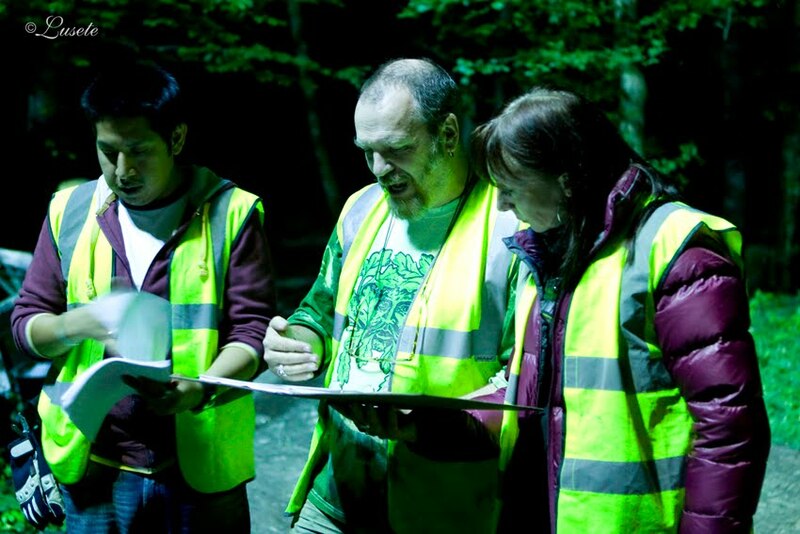 Simon, Gary and Dodie keeping track of just how much there is left to shoot! We called “cut” for the final time at 08:30 and after some very welcome breakfast some cast and crew left as they were wrapped on the film and others climbed wearily into tents and cars for a well-earned rest. Others cleared away some og the kit that was no longer needed and got things ready for the afternoon shoot – the final shoot of the movie and it was a big one. ‘Morrighan’ – the dead of war singing in the woods and lots of battle stuff for a montage in the song. Over 40 extras, re-enactors and stunt performers assembled by 12:00 and costumed up. For the only time on the whole shoot the weather took a turn though, and we had to delay the start of filming as we all sheltered from torrential rain. The cast were all game though, even volunteering to carry on in it anyway but we didn’t have enough protection for the cameras to even consider that. It eased up enough though that we were able to turn over by about 13:30 so we only really lost an hour. We did shoot slightly less coverage than we would have done but we still got everything we needed. Seeing all those people dressed in so many different periods standing amongst trees was a haunting and beautiful experience. 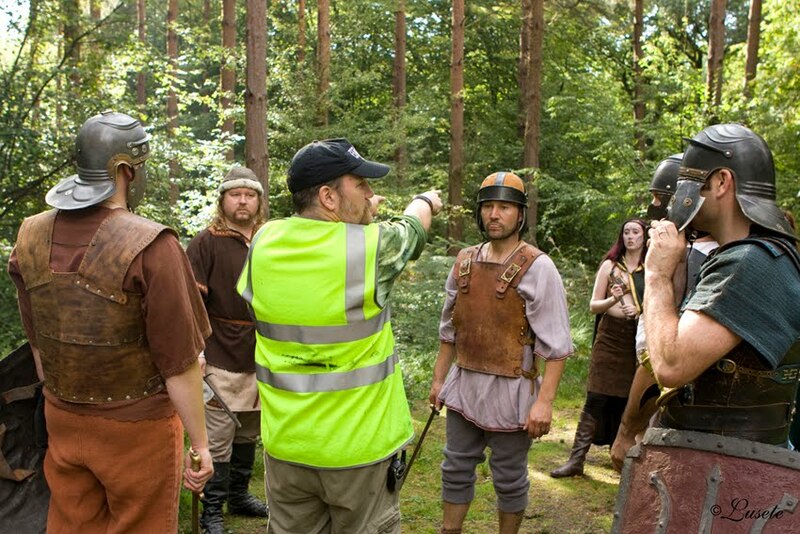 The battle scenes went superbly – we managed to capture Vikings & Saxons, Medieval Knights, Napoleonic Redcoats, World Wars 1 & 2, Modern Military and we finished up with Romans and Ancient Britons, calling cut for the final time at 16:45. And that was it – a wrap. Principal photography over. It seems hard to believe we had already arrived but looking back we have achieved a huge amount in a short time. The credit of this has to go to a hard working and very professional team of cast and crew who have put in so much effort for the love of this project. So, this page closes now and the blog will continue on the Post Production page. THAT'S the way to get what you want on set!